June 28, 2013 - Lain Lawrence, 53, a former UK airline pilot told a British court that the car accident that resulted in the death of his wife was a result of a leg spasm leaving him unable to drive properly. However, on Wednesday the court did not buy his story and sentenced him to life in prison. 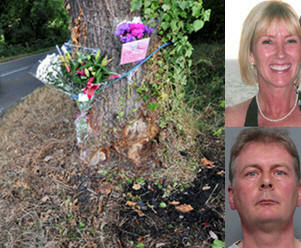 On October 6, 2012, just two days before his divorce was to become final Lawrence carefully devised a brutal plan in which he took his wife Sally for a drive in his car in which he deliberately crashed the car into a tree which resulted in her death. In Court Lawrence said his leg went into a "full blown" spasm sending an "excruciating" pain down to his toes. "It's horrendous. You can't move. I've just got to hold on for grim death. It hurts so much. "I put my right leg straight down onto the accelerator. Sally shouted 'What's happening?' because I was holding on tight at the time. I was trying to get my foot off the accelerator. I shouted 'It's my leg'." The court surmised Lawrence had chosen a street that he was familiar with and that could accomplish his objective, he disabled the passenger air bag in his car and the act was committed on the weekend that their son would be away on a school trip. The court believes that Lawrence was able to convince his wife to take a drive with him either by deception or force. The evidence in court showed that when Lawrence approached the spot which was to be the accident site he reached across and unclipped Sally’s seatbelt. He then steered the car, the passenger side directly into a large tree at or above 50 mph. Lawrence had got into brace position before the crash and was protected by his seatbelt and his air bag. Sally died of catastrophic injuries while Lawrence walked away from the collision with a few bruises. Lawrence would have gotten away with murder if it had not been for the careful and thorough investigation carried out by the police. Evidence showed that Lawrence killed his wife because he could not accept that his marriage was over, he was determined that Sally would never leave him and by financial gain. Lawrence refused to accept that Sally through a divorce settlement would have received full proceeds from the sale of their home and receive other assets. He told Sally just a few days before her death that he believed by rights should entitled to half of the sale of the home and be allowed to keep the family assets. In a text message Sally sent to her daughter the night before she died she said “I know money isn’t everything, but to him it is”. UK’s Leicester Crown Court found Lawrence guilty of murder and sentenced to 24 years in prison with no parole.